Oh hey, it’s Empties time again! This time I have a bag stuffed completely full of wonderful things I’ve used up – some amazing; some I’m happy to see the end of! Here is proof of the extent of my empty product hoarding, a trip to the recycling bin is long overdue..
On to all the products! 2. Dove Deeply Nourishing Body Wash (£1.20 via Boots) – This body wash is so old, it even has my name written on in Sharpie from living in a student house! I grew sick of the strong powdery scent pretty quickly, yet it took so long to finish the huge bottle up. It was decently moisturising, but left residue in the bath (and again, the smell). I much prefer my Lush shower gels. Repurchase? No. 3. Superdrug Sensitive Shave Gel (£2.85 via Superdrug) – Superdrug own brand products are excellent value for money, yet can be fairly hit-and-miss for quality. Saving over 60p on the Gilette version, this one is pretty much the same product (great lather for leg-shaving, ideal for sensitive skin) – it’s just the packaging that isn’t the most brilliant, as the product has a habit of foaming up into the lid. Nothing major, but when Gilette isn’t on offer and you’re in need of shave gel, this is definitely the most wallet-friendly option. Repurchase? Yes. 4. Vaseline Spray ‘n’ Go Moisturiser in Cocoa Radiant (£3.32 via Lloyd’s Pharmacy) – Such a raved-about product yet I’ve only just managed to finish mine! I have the US packaging, which is definitely easier to hold, but the product is exactly the same. Ideal for mornings where you’re in a rush but don’t want to spend valuable minutes frantically massaging in body lotion. This mega-easy spray is easy to apply and sinks in within seconds, truly revolutionising your morning routine. My favourite is the Cocoa scent, but I really want to try out the Essential Moisture and Aloe versions to compare. Repurchase? Yes. 5. Mellor & Russell Macadamia Oil Moisture Rich Body Butter (£1 via Poundland stores) – Have to say how much I adore this body butter – I really wasn’t expecting to enjoy something from Poundland quite so much! The packaging drew me in as it looked similar to that of the expensive Macadamia hair products, yet I’m certain this super-light & nourishing lotion could pass for a similar high end product. With shea butter, macadamia oil and Vitamin E, this body butter has a wonderfully light, almost whipped texture, allowing easy application. It doesn’t feel the least bit heavy or greasy, absorbs fast and leaves skin feeling soft, smelling good and moisturised after shaving. Who knew Poundland beauty products were so great? Repurchase? Yes. 6. 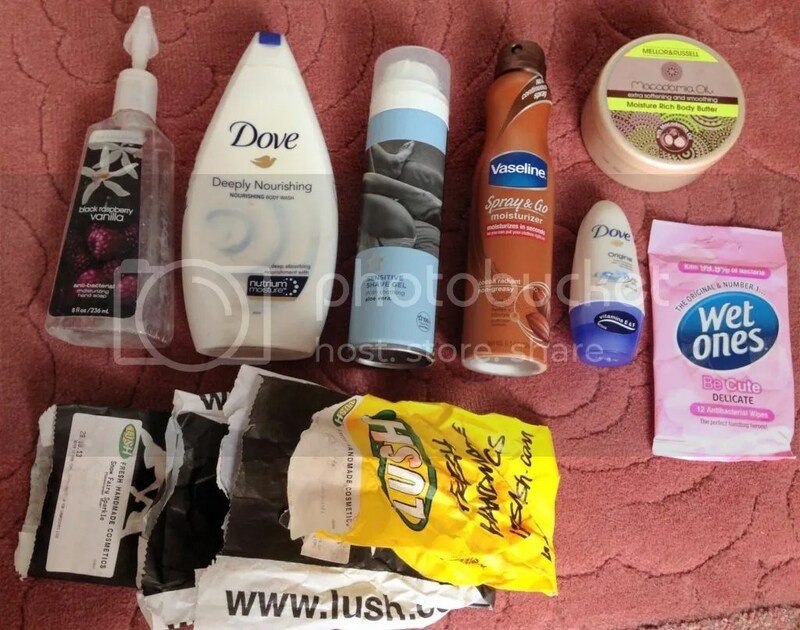 Dove Original Roll-On Antiperspirant Deodorant (£2.20 via Tesco) – Another Dove product? Unsurprisingly, this wasn’t a favourite either. I’m all for products that claim to be gentle on the skin, and I can put up with the light powdery scent briefly, yet once I applied this I stank. I had to tissue this off and apply something else since it made me feel nauseous – I don’t think the scent works with my body chemistry at all! Back to square one – any deodorant recommendations?! Repurchase? No. 7. Wet Ones Be Cute Delicate Antibacterial Wipes x12 (£1.10 via Waitrose) – Okay, not your typical beauty product, but this is a good one to have on you all the time! These are so useful for travelling on public transport or in a city, I always have a pack on me when I travel to London. When you’re not able to find somewhere to wash your hands, these at least get rid of the dirty, grimy feeling from your hands and make them smell somewhat pleasant. Repurchase? Yes. 8. Lush Snow Fairy Sparkle Massage Bar – Unfortunately no link, as these were exclusives for Christmas 2013; hopefully they’ll return later this year! A neon pink fairy-shaped massage bar by Lush, sharing the same delicious fruity scent as the cult favourite Snow Fairy shower gel, these are ideal for rubbing all over your body after a bath or shower for a serious moisture boost. I was never into their massage bars, always thinking they were a more ‘intimate’ thing for couples (although they can be if you want them to! ), but as this was a Christmas exclusive I had to try it out for myself. This particular bar is very ‘melty’ in warm hands so has to be used quickly! I find it’s best used before bed, since it does colour the skin pink slightly and skin feels quite greasy (although nicely moisturised) afterwards. Containing organic shea butter, murumuru butter and almond oil, these are quite the treat for your skin, but not one I’d use every day (despite the amazing scent) as they can be quite messy and don’t absorb quite as fast as I’d like them to! Repurchase? Yes, when available. 9. Lush Rose Jam Bubble Bar (£3.50 via Lush) – One of the lovely bubbleroons by Lush which can easily be split in half for two baths, this produces a brilliant amount of true rose-scented bubbles. I use this with the Rose Jam shower gel which was a Christmas limited edition and I smell like a rose garden – add some Ro’s Argan Body Conditioner for an extra boost of scent and added softness. I never used to like rose scents much, but the Rose Jam shower gel truly converted me! Repurchase? Yes. 10. Lush Sunnyside Bubble Bar (£3.75 via Lush) – The infamous glittery gold Lush bubble bar! This predominantly citrus scent (think oranges and lemons) is super-cheerful and uplifting – an ideal antidote to a dreary day. I cut this bar in half, lasting me two bathtimes. My body didn’t look obviously glittery afterwards, but I did have to give the bath a good clean afterwards! Repurchase? Yes. 11. 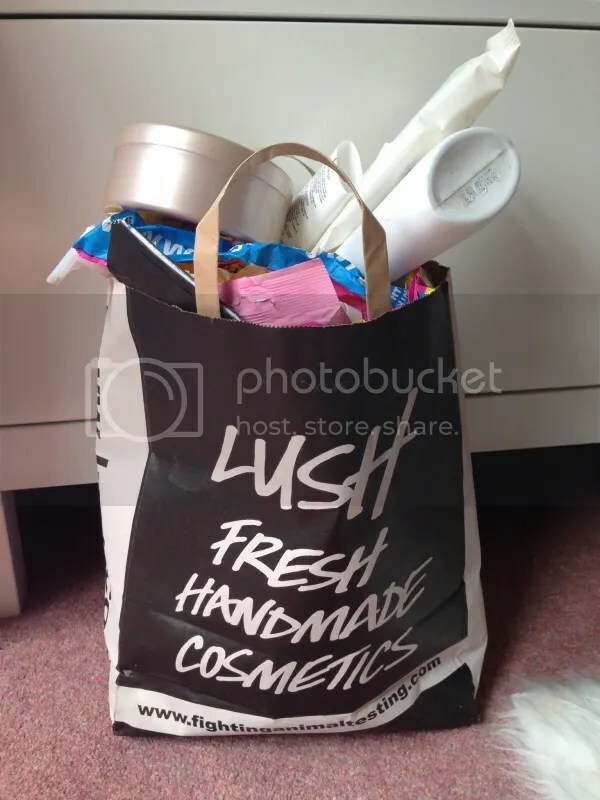 Lush Brightside Bubble Bar (£4.50 via Lush) – An Easter exclusive I found in the bottom of my Lush basket (yes, I have a basket in my bathroom just for Lush bath things! ), I was surprised I didn’t use this up sooner! A similar swirled, chunky format to the Comforter bar, this one is intensely orange-pigmented as well as orange-scented, the smallest amount turning your bath a vibrant orange. Luckily neither myself nor the bath was stained! It produced a good amount of bubbles and this lasted me 5 bathtimes, making it pretty good value for money! The Comforter bar is my all-time favourite, but this is great for switching things up a bit if I’m in the mood for something orange-scented! Repurchase? Yes. 12. Lush ‘Let The Good Times Roll’ Cleanser [Sample] (from £6.40 for full size) – Don’t you love it when Lush make the rare decision to make a brilliant limited edition product a permanent addition? Despite this only being a tiny sample-sized pot, it lasted me ages! This caramel popcorn (yes, it contains real popcorn!) concoction is more of a scrub than a cleanser (keep away from eyes) – a pea-sized amount will scrub off any dead skin, leaving you with the softest face ever. I loved it, except it was a bit rough for my sensitive skin and left my nose a bit red afterwards. Repurchase? No. 13. Yes To Cucumbers Soothing Hypoallergenic Facial Wipes (£3.99 via Boots) – Like the ‘Yes’ wipes as they’re thick, durable and soft, but they sting my eyes if any of the moisture goes into my eyes! Otherwise pretty good wipes for removing the bulk of your makeup. Repurchase? No. 14. Mudd Original Mask (10 applications) (£3.99 via Fragrance Direct) – Favourite face mask! Ideal for anyone with oily or combination skin who suffers from blocked pores, these are perfect for sucking out dirt and leaving your skin baby-soft and clear without irritating in the least. I use this once or twice a week to keep my skin clear – love them! Repurchase? Yes. 15. 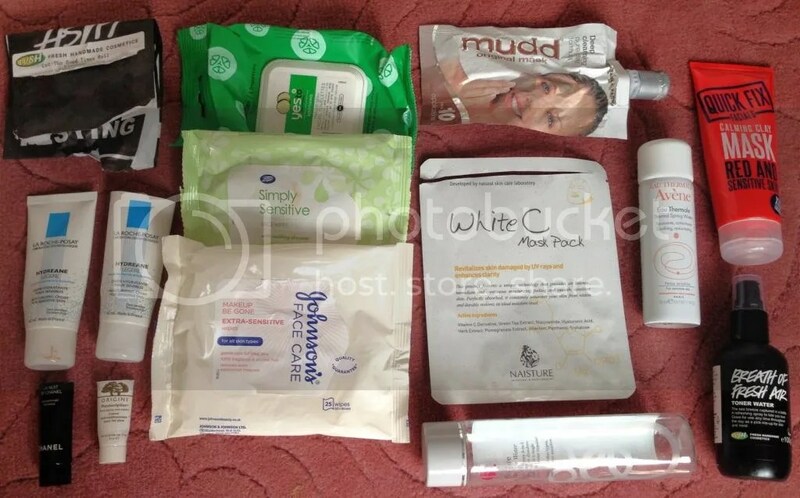 Quick Fix Facials Calming Clay Mask (£4.99 via Boots) – On the other hand..this was horrible! I’m not sure how a product claiming to be ‘calming’ made it feel like it was burning my skin off – this hurt so much after a few minutes. Fairly sure I must’ve been allergic to something in the formula – this does happen with other face masks and I’ve no idea what it is. There definitely needs to be more good face masks for sensitive skin! Repurchase? No. 16. La Roche Posay Hydreane Legere Moisturiser (£10.20 via Escentual) – I used up 2 of these in 2 months! My favourite moisturiser – love how bland and gentle yet hydrating it is without being oily in the least. Many other moisturisers contain perfumes or other unnecessary chemicals which irritate my skin, yet this gives my sensitive combination skin the perfect boost of moisture without problems. I’m currently trying lots of different LRP products which I’m enjoying so much. I just wish they made this in bigger sizes since they don’t last long! Repurchase? Yes. 17. Boots Simply Sensitive Face Wipes (£2.79 via Boots) – Intended as a cheaper dupe for Simple face wipes, these were a bit of a letdown! The wipes were scratchy, flimsy and made my eyes sting when I got them too close. How are these for ‘sensitive’ skin?! I was glad to finish these up. Repurchase? No. 18. Johnson’s Makeup Be Gone Extra Sensitive Wipes (£1.52 via Superdrug) – Too similar to the last ones – too scratchy and not that effective! I picked these up because my nan loved them, but unfortunately they’re nothing special – I’m going to keep looking for something better. Repurchase? No. 19. White C Mask Pack – Another goodie I received in my Makeupalley Secret Santa box at Christmas – my Secret Santa was so generous and sweet! I’d already tried one and this is the second. These sheet masks look hilarious on your face and cool the skin nicely, but I didn’t notice any huge difference afterwards. Repurchase? No. 20. Avene Eau Thermale 50ml (£2.75 via Escentual) – I am so late to the thermal water train, but I thoroughly enjoyed this. Currently working my way through the La Roche Posay version! This tiny spray was perfect for using after cleansing, or when my skin was particularly hot or irritated. I imagine this would be perfect for keeping in the fridge for using on holiday, or after you’ve spent some time outside in the sun. So refreshing and calming for my skin. Repurchase? Yes. 21. Lush Breath Of Fresh Air Toner Water (£3.95 via Lush) – Lovely and refreshing with a subtle, naturally pleasant scent, but I’m yet to be convinced that toner is a truly necessary part of my skincare routine! I used this up, but didn’t notice a difference in my skin. Repurchase? No. 22. B Pure Micellar Water (£2.47 via Superdrug) – This is hailed as a “Bioderma dupe”..and it is pretty good! I prefer Bioderma Hydrabio as my micellar water of choice, but this is a good backup to have, as Bioderma can be expensive. Gentle, non-irritating, wide availability and a great price. Repurchase? Yes. 23. Chanel ‘Le Nuit De Chanel’ Evening Recharging Face Care [Sample] (£60 via Selfridges for full size) – I enjoyed using this sample – it lasted a few days, leaving my face looking bright and feeling soft the next day. I didn’t like the perfumed scent in a product I was applying to my face. However, £60 for a small bottle of night cream?! Not quite within my price range, I’m afraid! Repurchase? No. 24. Origins Plantscription Anti-Aging Eye Cream [Sample] (£36.50 via Origins for full size) – Unbelieveably, this tiny tube lasted me over a month! The thick, creamy formula goes a long way, so only the tiniest amount is needed each time. I’m not sure if this made me anti-age at all, but it was pleasantly hydrating on my under-eye area. Now I just need another sample size for travelling! However I don’t think I can quite justify paying over £36 for an eye cream at the moment, however moisturising it may be – it would have to work miracles for that! Repurchase? No. 25. Cover Girl Clump Crusher Mascara (£8.99 via Amazon) – Bought on my last trip to the US, this cost me considerably less than the £9 link above! I’d heard a lot about this mascara, so I was curious to try it out. The packaging is definitely not the most practical – I keep my mascara in empty jars with my brushes, so it took up a bit too much room. The formula is definitely true to the name, no horrible clumps, which I have found with Maybelline Lash Blast and Too Faced Lash Injection mascaras in the past, not a look you’d want to be rocking. Added to minimal smudging, this is a great mascara formula I’m glad I bought a backup of. Now if they could just sort out that packaging! Repurchase? Yes. 26. Collection 2000 Eye Brow Definer in Blonde (£2.79 via Superdrug) – My favourite brow pencil! The perfect light brown taupe shade for pale brows, without looking red in the least. I use this to lightly fill in brow hairs, and then set with my MAC Brow Set tinted gel for my best-looking brows. A good brow pen is tricky to get right, and I’m glad this one does it well for such a reasonable price. Repurchase? Yes. 27. 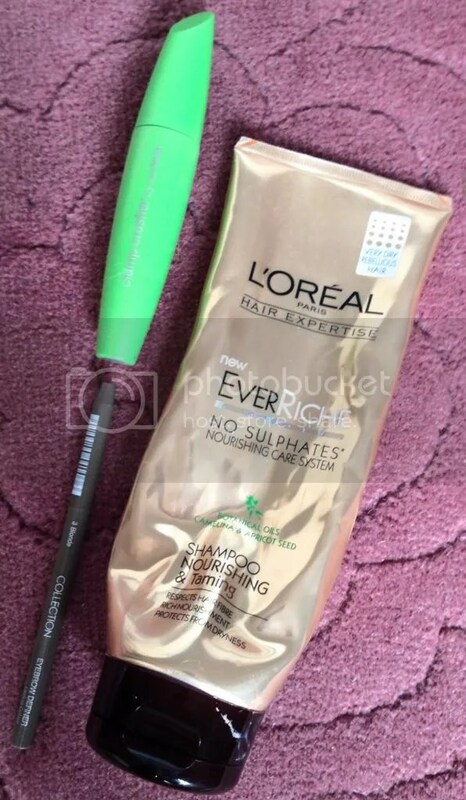 L’Oreal EverRiche Nourishing & Taming Shampoo (£5.99 via Superdrug) – So L’Oreal does EverSleek, EverPure, EverRiche..and then all the different sub-products underneath?! Slightly confusing! I didn’t even notice that mine was ‘Nourishing and Taming’ but there is also ‘Nourishing and Flowing’, just to confound you even more. Is there really enough of a significant difference? Bafflement aside, this was an excellent moisturising shampoo, wonderfully creamy without making my hair look greasy in the least. The lovely vanilla scent also complemented my Lush American Cream hair conditioner well too. My hair felt wonderfully soft and smelled so good afterwards. Repurchase? Yes. Phew, that’s it for all my empty products over the last two months! Maybe I should do these more regularly, so it’s not quite as overwhelming. I’m beyond pleased with the rate at which I’ve been using things up – I’m one of those people who feels wasteful and stressed with cabinets full of unused products, and it’s great to use them up and enjoy them! Hope you enjoyed, I’ll be posting my next collection at the start of September, so be sure to look out for it!